Offering you a complete choice of products which include liquid level switch, water level gauge indicator, float level switch, float level indicator, float level gauge and digital level indicator. Connection Flanges , Screwed , Square Flange etc. “KABIR” Make Magnetic Level Switches is specially suitable for high and low level signalization or automatic level control (by starting &stopping pumps or opening & closing of valves) in vessels. Horizontal mounting type directly on vessel or on External Chamber.Compact & rugged construction consisting of a free moving pivoted float assembly and a switch enclosure in non - magnetic material to achieve undisturbed magnetic flux. It employs dual magnets, one carried by the float arm and other by the contact carriers housed in the switch enclosure. A change in liquid level brings the like poles of dual magnets opposite to each other and resulting repulsion force ensures a changeover of contacts with snap action. The magnetic transmission is glandless, leaving no scope for leakages from vessel into switch housing. These switches are manufactured in various materials, enclosures & special features to suit broad range of media / applications. They are designed to provide high repeatability and to minimizes effects of shock, vibration & Pressure. Mounted internally or externally through a chamber. External mounting is resorted to, where space is a limiting factor or mechanical devices like stirrers operate within the tank. Besides, in applications like boilers, reaction kettles etc., with external mounting, isolating is possible for regular servicing. The switch is normally side-mounted, however for applications like slurry, top installation is preferred. The switch can be wired directly "to make or break electrical circuits", of burners, heaters, motor pumps, alarms and other such electrically operated devices. Fuel oil tank control, Boiler feed water drum control, cooling tower lubrication/cooling/filtration systems, paint shops, water/waste water treatment plants, food/drug/pharmaceuticals/petrochemical plants/separation plants, sealing liquid level control for generators etc. “KABIR” Make Tubular Level Indicator (Side Mounted) with Tie Rod design, with Scale OR without Scale, with OR without inbuilt Valves. It is a reliable device for reading the level of liquid. It is a simplest form of level indicator. 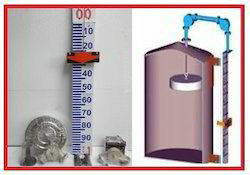 These level indicators find wide application for level measurement in process tanks, batching tanks, vessels etc. “Kabir” make Multi Point Magnetic Float Level Switch which are useful for larger tanks monitoring up to eight independent levels in a single device. These are available in length up to 3500 mm and are manufactured using various combinations of floats depend upon the services, various mounting and materials. These are able to effectively track changing levels within the tanks and are proficient in monitoring liquid interfaces of dissimilar liquids in single tank line oil- water separations, chemical emulsions or condensation levels. DESCIRPTION“KABIR” Make Float & Board types Level Gauge are used for fluid level measurement in several industries. The Float which is of course the most important element of the instrument. In fact, its structural design, volume displacement, weight, and buoyancy force are all taken into careful consideration when a float is specified for a particular application.Often A typical Float & Board type Level Gauge is consist of a Float, dust proof Pulley Housing, Pointer cradle with nylon and 150 mm width screen printed Aluminum Scale. This instrument is an absolutely reliable and accurate system for liquid level measurement in tall overhead tanks. 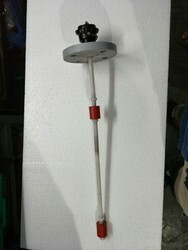 WORKING PRINCIPLE This type of Float & Board type Level Gauge basically work on the principle of buoyancy. The float is well connected to the counter weight along with a pointer through flexible wire ropes. The pointer slides along the guide against a graduated scale to indicate corresponding levels inside the tank. Flange ANSI, DIN, JIS standard or to be ordered. Kabir make multi level led indicator in % and ltr. The features of a typical float and board level indicator can be detailed as follows. KABIR MAKE Switches are the most versatile for level control and have advantages over float type switches in the control of agitated liquids paints-varnishes & heavy oil and foaming liquids. The Displacer weight is heavier than the liquid which is suspended by a spring. When the liquid rises the displacer looses the weight, this causes the spring to retract slightly to a new equilibrium position. This retracts of the spring interchanges the position of the Magnet provided at the top and actuates the switch. Upto three independent switch junctions are available in the single unit, with broad choice of operating sequences. These are flange mounted and are available with a choice of material of construction. It is based on buoyancy principle and is available in different material of construction for a variety of switching functions. The instrument can be used for level switching function in large tanks upto 20mtr, in turbulent liquids and even without steel pipes. The switch position can be adjusted at site depending upon the requirement. It works reliably upto 300ºC temperature & 40 Kg/cm² pressure. The Material of construction may be MS, SS304/SS316 OR PP and the enclosure protection confirms to IP65/IP67/Ex-proof IIA & IIB or IIC. It is economical for large vessels & can be easily transported. Most often, the floats and board level indicators find its application in over ground and over head storage tanks. They are also used in storage tanks of petroleum products, like furnace oil, diesel, and lube oil and so on. Also, it is used in storage of vegetable oils, molasses, silicates, glucose and so on. In short, the float and board level indicators are most widely used in all non hazardous and non pressurized tanks. 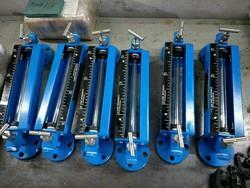 "KABIR" Make Float & Board types Level Gauge are used for fluid level measurement in several industries. The Float which is of course the most important element of the instrument. In fact, its structural design, volume displacement, weight, and buoyancy force are all taken into careful consideration when a float is specified for a particular application. "KABIR"also offers Vapor Seal Type Float & Board type Level Gauge which is generally used for tanks having corrosive fumes / vapors OR N2[Nitrogen] Purging tanks. 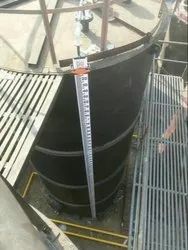 In this level gauge the float is connected to a magnetized counter weight moving in a sealed S.S. OR PVC pipe & which drives a follower magnetized bi - color capsule inside a glass tube to indicate liquid level. Looking for Level Instruments ?